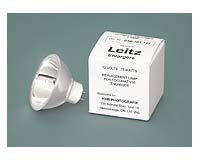 75W 12V quartz-halogen reflector lamp for Leitz Focomat V35 enlargers. Fits all Focomat V35 enlargers with the exception of very early models which use a slightly larger, and now obsolete, Philips #6604 lamp. If in doubt as to which bulb you need, please inquire. Note: A conversion kit is available to upgrade the lampholder on early V35 enlargers to accept this later type lamp. Please see the separate listing.